All-in-one joint supplement containing a proprietary blend of certified organic, super-premium ingredients for Total Body Health. 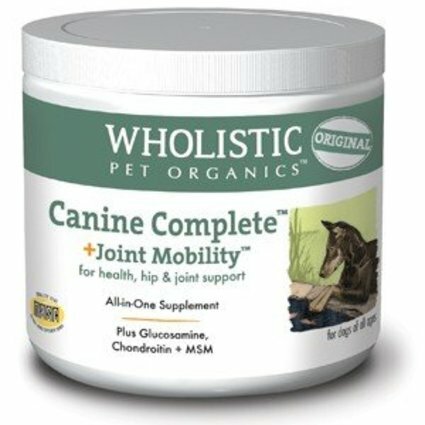 The same certified organic ingredients as Wholistic Canine Complete but with the addition of our own proprietary blend of a powerful, supportive joint formula for Total Body Health. 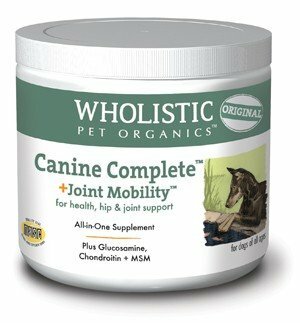 Wholistic Canine Complete Joint Mobility is an all-in-one organic, human-grade supplement that provides your pet with a complete array of vitamins, minerals, digestive enzymes and probiotics, essential fatty acids, and powerful antioxidants in combination with our own unique joint mobility formula! High bioavailability is ensured by the use of Organic, Human-Grade Whole Food sources as opposed to artificial, synthetic ingredients. Used not only by active dogs and older dogs who need additional joint support but, also used for the large to giant breed puppies and dogs to help avoid joint problems. Ingredients: Certified Organic Kelp, Certified Organic Flax Seed, Organic Bee Pollen, Human-grade Hydrolyzed Whitefish (A concentrated source of predigested protein), Chondroitin, Glucosamine sulfate, MSM (Methylsulfonylmethane), Vitamin C*, Certified Organic Garlic, Organic Lecithin, Certified Organic Spirulina, Lactobacillus acidophilus, Bifidobacterium longum, Amylase, Protease, Protease II, Protease III, Lipase, Cellulase, Lactase, Peptizyme SP, Maltase, Invertase, Bromelain. *Vitamin C as Ester C. Glucosamine 800 mg, Chondroitin 800 mg, MSM 750 mg. There is approximately 52 tablespoons (156 teaspoons) in every pound of Wholistic Canine Complete. A one pound bag will last a 30 pound dog 52 days, or almost 2 months! Very cost effective for a product that is all-organic and provides your pet with such powerful nutrients for maximum nourishment! In addition, the largest of dogs require just two tablespoons daily, thereby very effectively keeping the cost down for the large to giant breeds.